It s quite bizarre really. 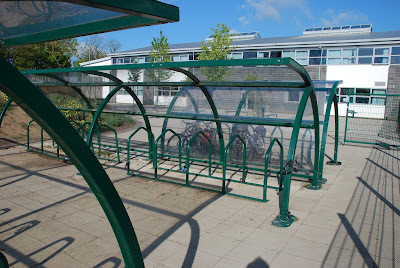 Many students would go outside rain or sun if there was a structure to sit under.... there rarely are.... Fear not though - the bicycles are fine! 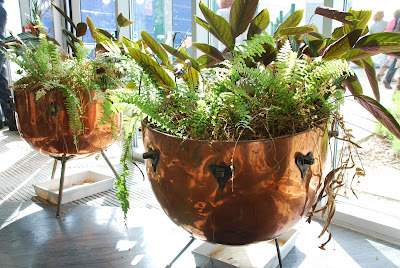 Visiting the Education Village in Darlington last week I was surprised to see two old timpani converted into flower tubs.... It turns out that they were to be disposed of. The alternative was to recycle them. They do make quite eye catching displays as you enter this particular building. 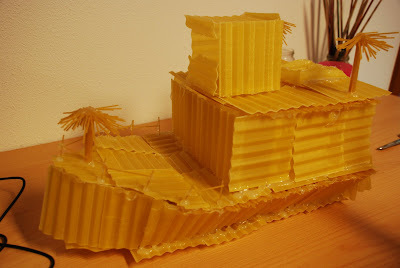 Not sure what else you could have used them for really- -any suggestions? Working out of North Carolina, his skills, talents and personality are considerable and, to top it all he is just a really good guy! 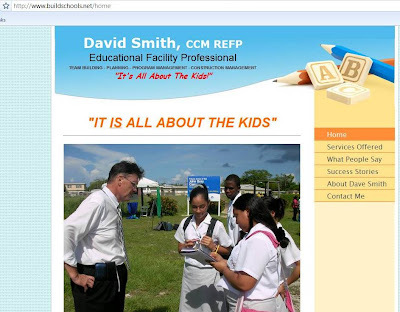 His new website 'Build Schools' gives a flavour of peoples' reaction to him and his work. I was humbled that he included my comments. Education is such a small world - you just never know when you are going to meet up with people again. But when you do get the opportunity to work with amazing people it is just brill! 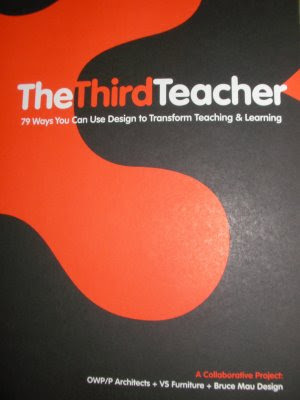 I am delighted that oWp/p have published their new book 'The Third Teacher'. 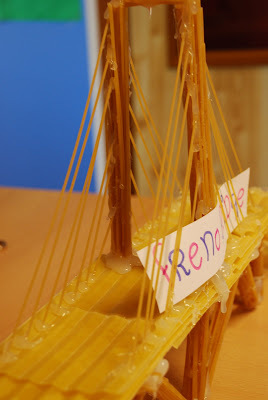 The title refers to the learning environment that students learn in. 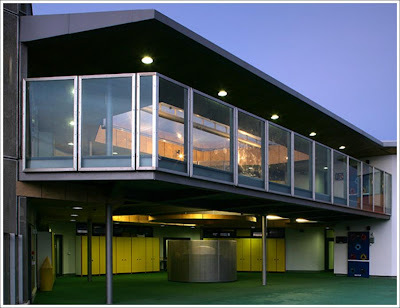 oWp/p are Chicago based architects, specialising in education facilities. I have worked with them extensively as architects of the fantastic new learning campuses being built in the Cayman Islands. They are truely a great team of people. 'The Third Teacher' has taken time to research and get right and reflects many examples of best practice from all over the world. It also includes a variety of interviews with field experts including Sir Ken Robinson and really explores the importance and impact of education environments. I must declare an interest in this book. Not only does it feature the new Cayman learning campuses which I was very involved with, but I was flown over from Cayman to the UK to be involved in one of the small very focused working dinners with a variety of people including Professor Stephen Heppell. I am flattered to also find myself quoted in the book, as well as a photo- if you look hard enough! The interest in new learning environments is intense at the moment, the more research that is done and presented to the interested world the better. A great book - well worth a read. Thanks to Rick Dewar and Trung Le of oWp/p for involving me from the start of this project! 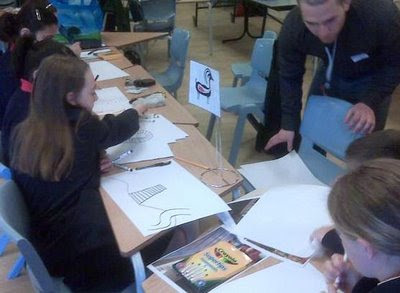 One day last week I was working with Year 7 students in Lancashire as we discussed designing new 21st century learning environments. As always they were excited and engaged, but crucially they were ambitious, creative and maintained a good degree of pragmatism. They clearly analysed several examples of interiors before setting about designing their own learning environment. They also had the opportunity to work with an architect who supported them and could explain as they explored and developed their own ideas. Their attention to detail in discussing the positive and negaitive aspects of natural light, artificial lights, colour and and types of materials again demonstrated the folly of those who do not consider students voice to be a powerful stakeholder in the development of new schools. The students were just excellent - their thoughts and ideas even better! 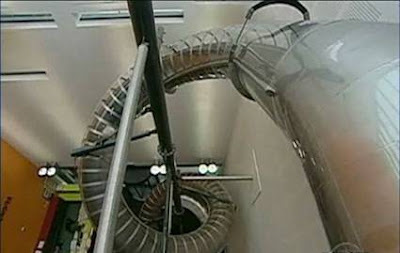 Considerable attention from all over the world has been given to the new three storey slide installed in the Electric Works offices in Sheffield which opened in March. It is for staff to use when they feel like it - it certainly beats stairs for many. Even todays media covers a story on it. They are not alone, the Google offices also have one. It's all about making the workplace exciting, vibrant, different and just plain fun - and why not? It is also about smart employers thinking outside the box and creating environments where staff want to work, and want to remain working! It's not the only feature of course, but the most unusual and the one attracting the most attention. It is about the entire environment and working experience. Everyone else has probably heard of, tried and uses www.wordle.net but I hadn't until very recently. 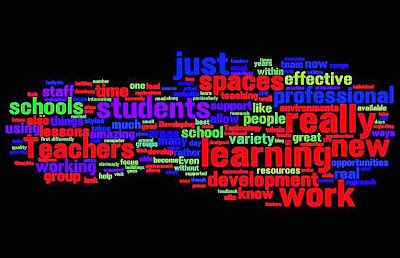 Simply drop in a piece of text or just a blog link, click and a word graphic appears featuring the key words. As long as it is not overused (always a danger), it may be useful for project and display work. The example shown was created using a link to this blog. I'd often seen this type of graphic, but had just just not realised that there was software for it. Obvious really! An interesting article this week appeared in the 'Times Educational Supplement', all about school bathrooms (or toilets). 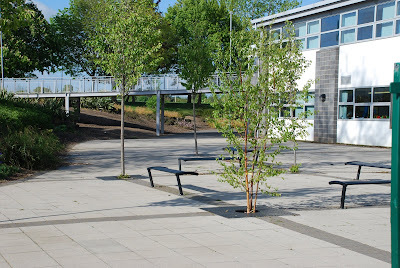 It really supported the needed for professional business standard facilities that are designed to prevent incidents including vandalism and bullying. It's about time really - for far too long they have been an undiscussed issue. 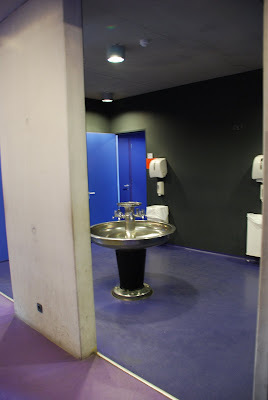 Toilets play a massive part in the views of students about their school. Any discussion with students about their schools always ends up talking about them. Lots of people have called school toilets lots of things, mainly negative, including 'bullying antechambers'. A significant percentage of students avoid visiting them all day if humanly possible. As a Head I always tried to provide really high standard facilities that were very regularly cleaned and stocked each day. Amazingly, this is not always the case. One school in Hull received ridiculous and ill informed national media criticism after a story about it upgrading its students facilities. A number of new schools have approached the design of these facilities with some imagination, ranging from individual cubicles off corridors, through to removing the 'fourth wall' to ensure passive supervision. Maybe the more radical idea has been to do the latter and also make them unisex. This is the case in a number of schools here and abroad, including the Centres for Learning in Knowsley (see top photograph) and the Tong High School in Bradford. This move is a real cultural shift in design. What has been reported is, predictably, the major reduction in damage and inappropriate behaviour. Whilst not everyone will like it it is an area that many schools have to do something differently. 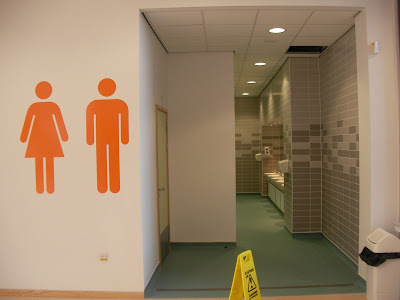 Surely the day of the 'industrial' toilets tucked away at the end of corridors has gone. If we design them correctly and put them where the students are, then then the negative behaviours can be prevented and those students who ask to leave the lesson no longer have the excuse to wander the school corridors for ages disrupting others. It's not rocket science - just different. I was very fortunate last week to go on the BCSE (British Council for School Environments) study tour to the Netherlands. The whole trip took just two days with five very different schools being visited. 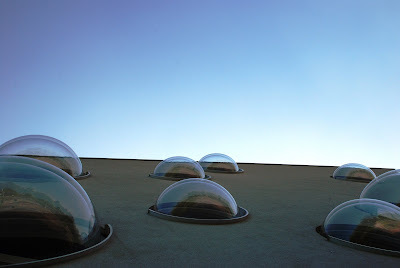 I suppose the most memorable was the award winning Facilitair Centrum Niekée in Roermond. 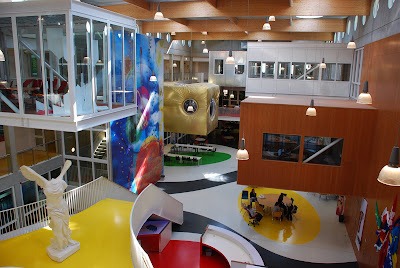 Niekée is based in a spectacular new 8000m² building and is really a very funky modern learning environment. It really is a dynamic learning environment. Students think it is a very cool building, and to be honest so did we. It certainly created lots to talk about and the architect talked us through the reasons for this unique design. This is a vocational school that previously did not have a great reputation. The new building has transformed this. Students come from all over, attitudes, attendance and attainment has really improved. They are engaged and motivated. People want to attend and stay. 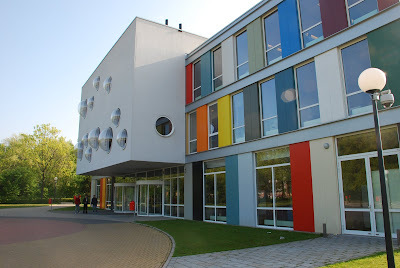 Students follow a project based curriculum and the school specialises in Technology and Business Studies. 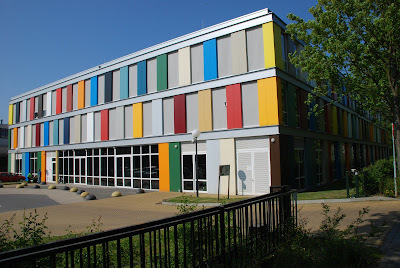 With floating classrooms in the central hall, a non conventional layout, transparency across levels and flexible furniture, climbing wall in the centre of the school Niekée is everything but a traditional school. Around the sociable central space on the ground floor are homebases and workrooms whilst pods project from the first and second floors. Each pod is of a different material, from glass, steel, wood through to gold fabric. Visiting new environments is a great way to learn from colleagues all around the world. The BCSE study trips play an important contribution in helping inform a whole range of stakeholders. A great experience BCSE and thanks. Visiting schools in the Netherlands last week, I was again reminded just what a cycling country it is. 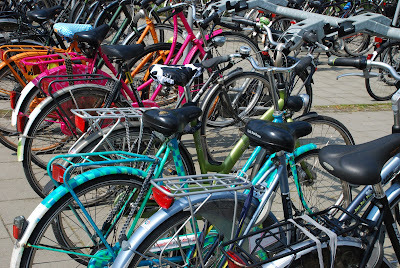 Valuas College in Venlo, with over two and a half thousand staff and students, has over two thousand cycles being ridden to it each day. As a result of course, many students are pretty fit. The difference, of course, is that cycling is part of the Dutch culture. This means that the whole infrastructure supports safe cycling, wonderful cycle lanes well away from traffic, their own lights, crossings and so on. It is built into the whole town planning culture. No wonder so many cycle. 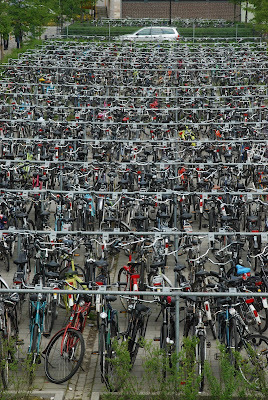 No way would I ride a bike through the crowded congested streets near where I live in the U.K. Now if we could incorporate this kind of infrastructure as we plan new schools in this country.........! If I lived in the Netherlands, maybe I would cycle as well.